Summary of today’s show: Deacon Thomas MacDonald found a calling to the priesthood while studying at University of Massachusetts, Amherst. Since then he has studied at St. John Seminary and the Pontifical North American College in Rome. This summer he was ordained to the transitional diaconate by Cardinal Seán and has served at St. Paul’s in Cambridge. He returns to Rome this fall for his final year before ordination. 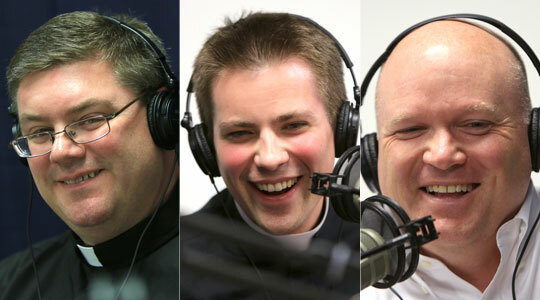 Deacon Tom joins Scot Landry and Fr. Chris O’Connor to talk about his journey to the priesthood and give listeners a brief tour of the Rome he has come to call home. 1st segment: Scot Landry welcomed Fr. Chris O’Connor back to the show and they announced that St. John’s Seminary is completely filled and can take no more men. There are 27 new men coming to the seminary this fall. It’s partly due to more men from Boston and more dioceses sending men to St. John’s. Scot said we need many, many more men to answer the call to the priesthood. Fr. Chris said they are strategizing ways to accommodate even more men next year. Scot asked Fr. Chris what he attributes the growth in seminaries to. Fr. Chris said in parishes with Eucharistic adoration, there you find vocations coming out. Fr. Chris said particular priests inspire young men in their vocations as well. Today’s guest is Deacon Tom McDonald, who was ordained a transitional deacon on June 30 this year and will, God willing, be ordained next spring. 2nd segment: Scot and Fr. Chris welcomed Deacon Tom to the show. He grew up in Westford, Mass. He was born in Concord, Mass. He is a lifelong parishioner of St. Catherine of Alexandria in Westford. Deacon Tom said the town of Westford boomed in his childhood and St. Catherine boomed as well. He attended public schools in Westford. He said the seeds of his priesthood were sown about the age of 16, around his confirmation. He had a reconversion as a young adult and became convinced of the truth of the faith and he and a group of friends grew together in faith. He attended University of Massachusetts, Amherst. Scot said UMass was known as a crazy school. Deacon Tom said the reputation was deserved in some places, but that’s also the place where his faith grew to include a call to the priesthood. He saw the sadness of the life lived away from God that opened his eyes to the gift of faith and the privilege of sharing his faith. It was through sharing his faith that he came to appreciate how wonderful it was to do that. Thanks to the help of Fr. McGonagle at the Newman Center that he was steered to the priesthood. Fr. Chris asked what helps in his own spiritual growth he encountered, what advice he would give to college freshman. Deacon Eric told them to get plugged in to what’s going on. Take the initiative and ask how to get involved. Stay close to young men and women who share your values and faith. The company you keep shapes your destiny over the next four years. He knew a number of students who faded away from campus ministry and took a tragic course. Much depends on those opening weeks, cultivating the right sort of friendships and getting involved in the right sort of activities. Deacon Tom said one of the advantages of going to a secular college was that there was a clear demarcation between the life of faith and the life of the world. All you had to do is wake up early on Saturday morning to see the “walks of shame” and the dazed looks. You can see that they are suffering from the lies of the world. On the positive side were the friendships built upon the fullness of the Church’s teachings and a life lived there. The decision was crystal clear. The goodness of God was so attractive in comparison with the darkness beyond. Scot asked what it was about the campus ministry at UMass that led so many to a deeper faith. Deacon Tom said it was the quality of friendships. When people would come to the Newman Center and get connected they would find themselves attracted to the friendships. Deacon Tom said his first instinct when he heard the call to the priesthood was to run. He heard the call as a freshman, but as a senior he resigned himself to exploring the call. During that time, he went to daily Mass, frequent confession, adoration. The quiet silence attuned the heart to hear God’s voice. After graduation he wanted to spend a year in service. He worked at Northampton High School working with kids with learning disabilities. Deacon Tom asked himself which hurt less: walking away from the possibility of marriage or walking away from the prospect of the priesthood. The priesthood won out slightly and he decided to give it a year. He was still very far from knowing he was called and it took a long time for him to stop going back and forth over the decision. Scot asked when it connected and he became settled about the question. He had asked to leave the seminary in February of his first year but the faculty had asked him to go to a priestly formation course in Nebraska. They asked him to go regardless. In the midst of the eight-day Ignatian retreat, he experienced incredible graces and all of his worries, concerns, and apprehensions were obliterated. Scot asked what he would say to young men listening who are wondering if they’re really being called. Deacon Tom said there is nothing to lose by applying to the seminary. He would recommend giving it a shot. If there’s a woman you’re interested in, you have to ask her out to determine if she’s the one for you. You can’t figure that out from afar. The seminary is like a courtship. By giving it a shot and experiencing it, he answered questions that could only be answered inside. Deacon Tom was also sent to the Pontifical North American College in Rome by Cardinal Seán. He hadn’t known anything about it beforehand and so he trusted the faculty to send him where he needed to go. He’s not a big traveler and so the prospect was daunting. He also loved his time at St. John’s, where he was with three friends from U. Mass, and where he felt at home. To leave for Rome was intimidating. He also had to study Italian. Fr. Chris asked what graces he received from studying at the NAC. The first major blessing was going into this unknown world and having to trust God outside the network of his friends and family, but in a more radical way. Being in the city of martyrs and churches is humbling. One can’t help but feel the immense place of Rome in the Church when there. Attending the big papal liturgies was electrifying, especially to se the love of pilgrims for Pope Benedict. The Pope exudes peace, calm, and power. People from every corner of the world crowd into the Square just to see him. Scot asked his favorite churches. Deacon Tom said his favorite is St. Paul Outside-the-Walls, built in classic Roman basilica style. Fr. Chris asked Deacon Tom what would be the perfect day visiting Rome. He said it would have to begin in St. Peter’s Square by the obelisk in the center, the some obelisk St. Peter saw as he was crucified upside down. Then they would go on the Scavi tour in the excavations under St. Peter’s, where the cemetery that held the bones of St. Peter were buried. This is the heart of the city. Then he would take them on a tour of the basilica itself, seeing the great altars and statues and art and windows. Scot said his favorite time in St. Peter’s is 7am where everyone is there to pray. Deacon Tom would then take people to the North American College for the best view of the city from it’s sixth floor. From there they would take the “Greg” route, which is their path to the Gregorian University and along the way they would see the beautiful Piazza Navona. The Piazza has beautiful cafes and fountains and art. From there would be the Pantheon, originally a Roman temple converted to a beautiful church dedicated to Our Lady. It’s a testament to the history of the Church. They would stop at the Gregorian University. Fr. Chris complained they haven’t stopped for food yet. They would also see the Trevi fountain, which Deacon Tom says is a trust trap with pickpockets. So they would go to Santa Maria Maggiore, the first church in Christendom dedicated to Our Lady. They have a relic of the creche, the manger in which Christ was laid in Bethlehem. Deacon Tom said in the fifth century a young Roman patrician had a dream about the Virgin Mary sending snow in the middle of the summer. He told the bishop and he interpreted it as a desire of the Blessed Mother for a church in the city. Sure enough the snow fell in Rome in the middle of summer. Rome is extremely hot in the summer and it hardly even snows in winter. This is the Feast of St. Mary Major on August 3. Ever year they drop white rose petals on the congregation to remember this miracle. From there it’s to the Colosseum and then St. John Lateran Basilica, the cathedral church of Rome. Scot said this is his favorite church in Rome. Fr. Chris disagrees and said St. Peter’s is first for him, then St. Mary Major, then St. Paul’s, and only then St. John’s. Scot said the Popes lived at St. John Lateran until the 16th century. Fr. Chris said the Pope celebrates Holy Thursday at St. John Lateran instead of St. Peter’s. Deacon Tom also recommends the neighborhood of Trastevere, which was the site of some of the first Christian communities in Rome. It was traditionally Jewish in the imperial time. It’s a beautiful picturesque and artistic community with wonderful food. Fr. Chris said there’s a Bohemian feel to the neighborhood. 3rd segment: Deacon Tom has been doing his summer pastoral assignment at St. Paul in Cambridge. He said it’s very vibrant, with a lot going on, including the boys’ choir school and campus ministry to Harvard. The parishioners are very active and involved. Fr. Chris asked Deacon Tom what is the basic message of his homilies. Deacon Tom said it’s that God desperately wants to be a part of your life in many and varied ways. Be vigilant and generous in opening ourselves to him. Scot said he thinks St. Paul’s is unique in the United States. He said people drive for more than an hour to come to St. Paul’s on Sundays. There’s a deep intellectual tradition that comes with the parish. Deacon Tom said he’s encountered a number of young people who have come into contact with the faith and who have questions and want to know more. He’s given a couple of talks at the parish on several topics and he’s had a very varied group of attendees, from Protestant pastors to agnostic political science students. Fr. Chris asked Deacon Tom to explain his position. He said a transitional deacon transitions from the diaconate to the priesthood. He will become a priest. They also take a promise of celibacy. Permanent deacons who are married do not. the deacon is also meant to have a heart for the poor and needy. In the liturgy, the deacon assists the priest at Mass, including preaching at the discretion of the priest. They can also baptize and witness marriages. Scot said many young priest and transitional deacons don’t have the opportunity to live in a full rectory like at St. Paul’s. Deacon Tom said some of the priests are on vacation but they’ve also had visiting priests, including some studying at Harvard. There’s been a wonderful fraternity and fellowship in the rectory. He’s learned a lot from the experiences and stories from the older priests. Deacon Tom said the parish was kind of quiet during the summer, but still was busy. He was surprised by the number of young people coming to confession every day after Masses. Fr. Chris asked Deacon Tom’s goals in Rome next year. He will be starting a new degree in theology and spending these months as a deacon and preparing for priestly ordination in May. His pastoral assignment will be teaching First Communion class at Santa Susannah in Rome, which is the American parish there. The students aren’t always American but are there to be exposed to new cultures.